Filmmaker Joshua Marston, AM’94, examines Colombian drug-smuggling from the inside out. In a small, fluorescent-lit room in the bowels of New York’s JFK airport, 17-year-old Maria faces off with two suspicious customs agents. While they interrogate her about drug smuggling, poking holes in her thin cover story, Maria, a slight and stubborn Colombian girl and the protagonist of Maria Full of Grace, calmly refuses to crack, despite the 62 pellets of heroin stuffed in her stomach. Like the film’s title character, Joshua Marston, AM’94, is graceful under pressure. At a July 26 sneak preview of Maria, a film he wrote and directed, Marston, a political-science graduate who earned a New York University master’s degree in filmmaking, deftly fields questions from the packed Old Town, Chicago, theater, laughing and spinning anecdotes about bringing his project to the big screen. Want to get your hands on an antiquarian treasure? Alumni screenwriters handle humorous and heavy themes with equal cinematic aplomb, as demonstrated by two summer releases: Hayden Schlossberg’s (AB’00) Harold and Kumar Go to White Castle (cowritten by Jon Hurwitz)—a meatier version of the classic stoner flick—and Joshua Marston’s (AM’94) Maria Full of Grace—which chronicles a Colombian drug mule smuggling heroin into the United States. The acclaimed films have more in common than critical praise. Graffiti—be it silly, socially conscious, or just plain crazy—adds spark to bathrooms and back alleys across the quads. Photographer Lloyd DeGrane beat out summer’s wall-art whitewashers to record tagged territory and anonymous communiqués, occasionally artful, often unintelligible. Chalk it up to inspired campus scribes.—A.L.M. 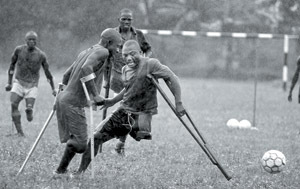 The Sierra Leone amputee football team practices in Freetown before its August 2003 United Kingdom tour. Photograph by Adam Nadel, AB’90 (see "Open Mike").